McKinney, Texas – The courtroom drama was simulated, but the competition—and the pressure—was very real. 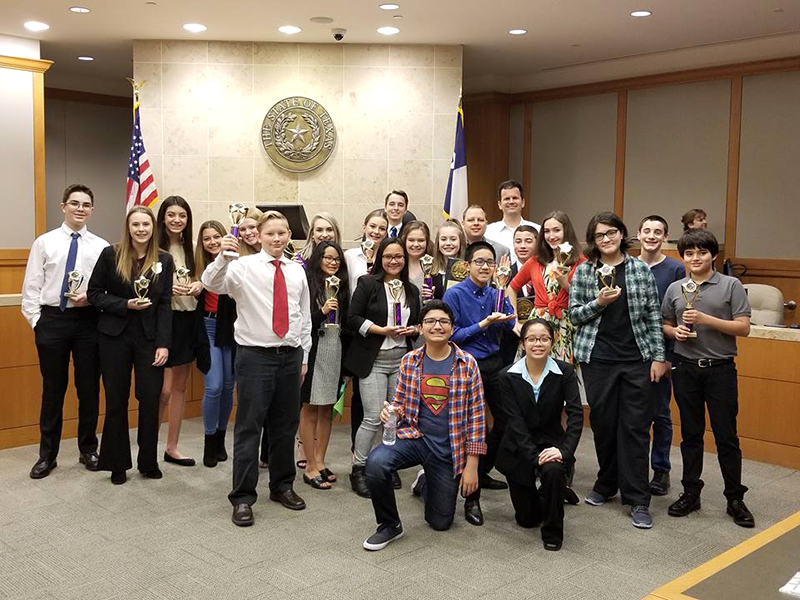 Thirty teams of eighth graders would have their day in court at the annual Collin County Bar Association Mock Trial competition held on February 16–17 at the Collin County Courthouse. While the docket was filled with talented teams, there could be only one champion. That was a team from Cockrill Middle School made up of eighth graders Megan Benner, Brady O’Conner, Sarah Knowlton, Madison Blackson, Diana Zapanta, Harley Bower, Savannah Nolan, Aaron Lam, Ethan Lee and Joseph Pentony. They claimed the school’s first ever victory in the intensive, two-day litigation competition that included teams from all five McKinney ISD middle schools as well as teams from Plano, Allen, Leonard and Princeton. It was a great day for Cockrill as eighth grader Brady O’Conner earned the Best Attorney award during the championship round, and teammate Sarah Knowlton grabbed the Best Witness award. A second Cockrill team also advanced to the semifinal round, giving Cockrill half of the final four spots. Dedication—perhaps as much as talent—is key in mock trial. Teams put in hours upon hours of preparation, and for the six weeks leading up to the competition, the groups from Cockrill spent every Friday evening and Saturday morning working together to prepare for their trials. Every team received the same case to prepare in advance and had to be ready to compete on trial day as the plaintiff or the defense. They wouldn’t know until shortly before they entered the courtroom which position they would argue. This year, the teams were faced with a hypothetical civil case involving a car service being sued by an injured customer. In preparation for the event, the teams received the facts of the case and statements from plaintiff and defense witnesses as well as other pieces of evidence. Gray added that the mentoring her students received from attorneys Ray Murphy and Lucas Henry of Abernathy, Roeder, Boyd and Hullett proved to be invaluable to their success. “They donated countless hours of advice, guidance and resources to our students, and they stretched participants beyond what the kids believed to be possible,” said Gray. That, in her opinion was one of the greatest benefits her students took away from the competition. The team from Cockrill, however, proved difficult to corner. And, they finished stronger than they started.